Bratt’s oral presentation, “Investigation of a Dipeptidase from Lactobacillis helveticus for the Enzymatic Detoxification of Gluten,” examined the effectiveness of certain bacterial enzymes in the detoxification of gluten. Bratt’s research was focused on the possible treatment of Celiac Disease. Bratt was judged on his knowledge and analysis of the material, creativity and clarity. He received a check for $1,500, which will be split between Bratt and Whitworth’s science program to fund future research. 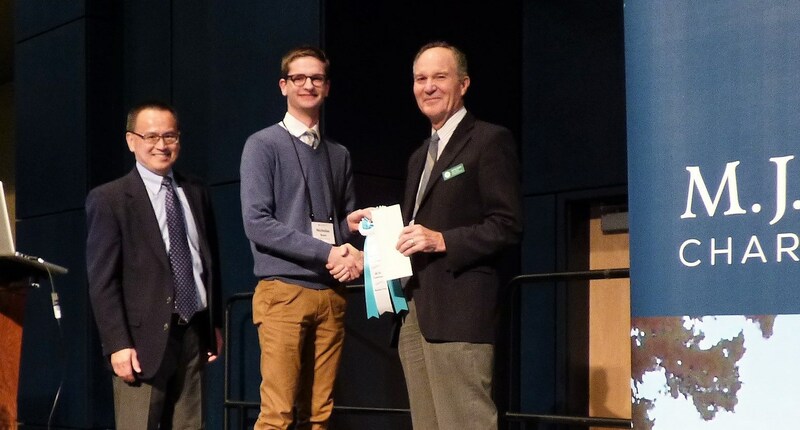 This is the second time since 2015 a Whitworth student has won a presentation award at the conference. Alex Hoffmann, ’16, received an award in 2015 for his collaborative work with Aaron Putzke, associate professor of biology, on zebrafish and cell development. The John Van Zytveld Award’s namesake is a longtime senior program director at the Murdock Trust and champion for undergraduate research and science education.